Simple Chilled Avocado Soup–health powerhouse, delicious, and elegant to serve. The simple green avocado. . .it is pretty, but certainly not as glamorous as it’s more “blingy” siblings–such as bright and colorful berries, dragon fruit, or pomegranate. Yet, it nourishes at a cellular level; and, it tastes smooth, refreshing, and delicious on the palate. Avocados differ greatly in size and because of this they differ in exact measurement of “how much per fruit equals x number of whatever vitamin/mineral.” Any fruit will also differ nutritionally dependent on how/when it was harvested; but, you can rest assured that adding a little avocado will give great nutritional benefits in a small package. One small serving of avocado packs 20 vitamins/minerals and plant compounds including a hefty dose of fiber and vitamins C, B-6, Manganese, and Folate. Research has also demonstrated that carotenoids–the orange/yellow pigments found in green leafy vegetables, sweet potatoes, and carrots– need some fat to be absorbed well into our cells. Avocados have some carotenoids all by themselves; but, when a small serving is paired with foods high in them–wow! You have a nutritional rock star created. The fat in avocados is a healthy monounsaturated fat that lowers the risk of heart disease and it helps all those carotenoids be taken into our cells to repair and strengthen. Vitamins, lowering heart risk, and increasing cell rejuvenation? I say bring on the avocado!!! Here is a recipe for a chilled avocado soup that can be served as an elegant plated first course or as a simple appetizer. Even better it couldn’t be simpler or faster to make. 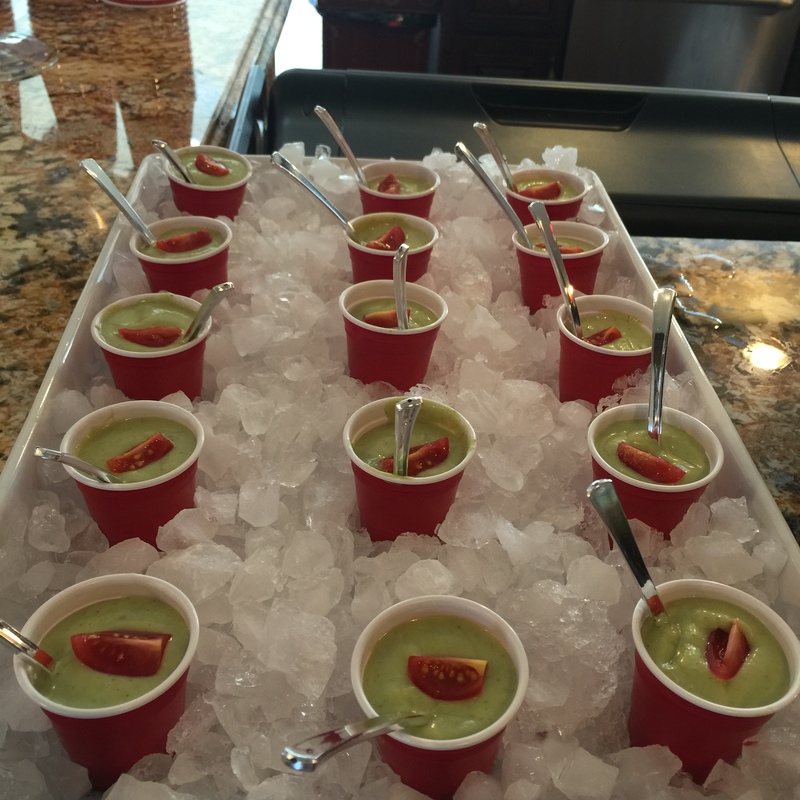 The picture is from a graduation party where the soup was placed in small cups as an appetizer over ice to keep chilled. Reduce chicken broth to 1/4 cup. This soup will be thick. Once chilled serve as desired. Garnish with tomatoes, green onion, or crab. ← Puttin’ Up Banana Peppers— Guaranteeing Our Next Cheeseburger or Hotdog Will Rock!